Suman Chatterjee imagined a brand new Micromax Canvas phone, actually a phablet called the Micromax Canvas X. This is a flagship smartphone that even gets a launch time frame: the second half of the year. This Micromax concept phone uses a 5.7 inch Super AMOLED Plus Full HD screen and it has a 13 megapixel camera at the back, with LED flash and a front 2 megapixel shooter. Inside the Micromax Canvas X we’ve got a quad core Qualcomm processor, probably a Snapdragon 600 at 1.7 GHz, accompanied by 2 GB of RAM and 16/32 GB of storage. 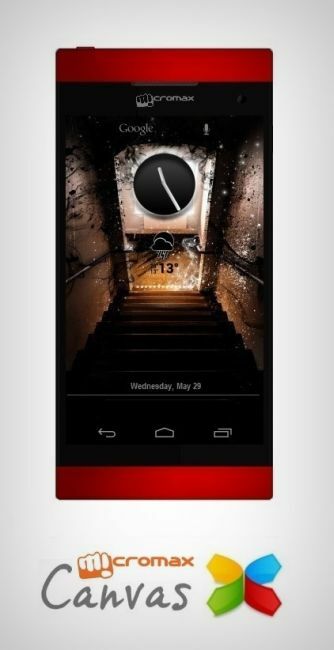 The handset runs Android 4.2.2, it incorporates a 3300 mAh battery and it’s both water and dust resistant. As you can see, the screen seems to be an edge to edge one and the whole design kind of reminds me of a Nokia Lumia with a hint of iPod. Also, the custom weather widget on the screen looks hot.